helps you write essays about poems more confidently. The app provides a variety of helpful hints at your fingertips. 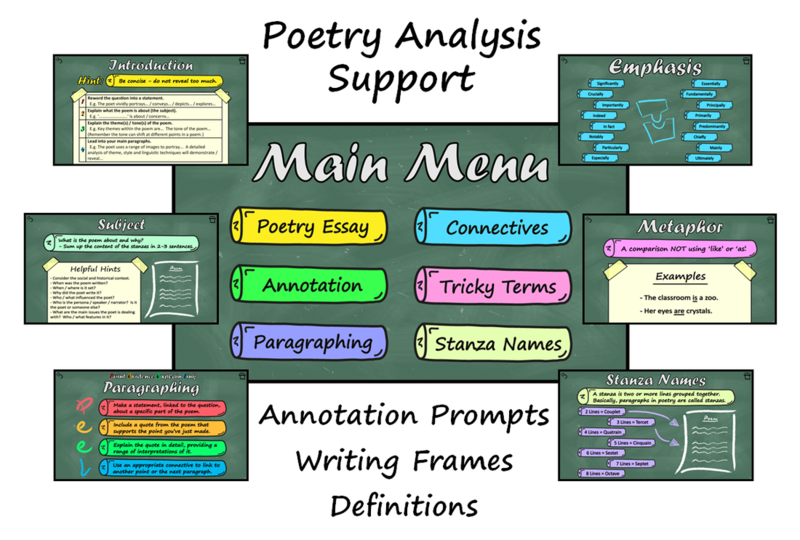 With Poetry Essay app, you will find all the help you need - from analysing your poem in detail to writing coherently about it. The annotation prompts will help you consider all features of the poem. When you come to write your essay, the range of writing frames together with sentence starters and suggestions for structured paragraphing, will assure you feel supported every step of the way. To make your essay sound even more fluent and professional, the app provides a list of connectives so your sentences flow, as well as a comprehensive set of poetry terms defined and simplified with examples. Whether you're writing a piece of coursework, a term paper, a controlled assessment, an assignment, or preparing for an exam, with Poetry Essay app you'll have a detailed essay constructed in no time. *Please note: Poetry Essay app is no longer available. Poetry Essay app gives you effective essay help. Easily navigate the area you need support with. Memorable annotation prompts will assist your poetry analysis. Select the specific poetic devices that you need to write about in your poetry essay. The range of sentence starters provide you with important discussion points in your poetry essay. Poetic terms are simplified and defined with helpful examples.